T Rex was the brainchild of Marc Bolan. Born in 1947, he'd hung around the fringes of the music business since his early teens working as a model, a "face" on the scene. But it was only in the hippy year of 1967 that he began to make any impact as a member of the fleetingly successful John's Children. Tyrannosaurus Rex came later that year, quickly settling on Bolan playing guitar and singing, accompanied by bongo player Steve Took (who'd be replaced by Mickey Finn in 1969). They were the archetypal hippy duo, with songs about wizards and fantasy, although they did come a bit more down to earth for the small hit Deborah. Championed by Radio 1 DJ John Peel, they gigged regularly around the country, building up a following. What most of his fans didn't realise however, was that Bolan was ambitious, with a strong rock'n'roll streak, which started to show on the LP A Beard of Stars, where he introduced electric guitar. 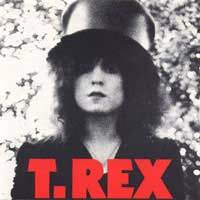 It found its full flowering in 1970 with the album T Rex - the new, shorter name showed a new image - much to the disgust of his old fans. T Rex emerged as a full blown rock band, with bass and drums backing up the duo. Bolan had completely switched to electric guitar and was pursuing a simpler sound, which he found not only on the album, but also on the singles he began to release, beginning with Ride A White Swan, the first cry of glam rock - Bolan had changed his image too, for one that was slinky and cooler, with dabs of make and shiny clothes. It was instant success, especially with teenage and pre-pubescent girls, who possibly found his elfin size and look non-threatening. For two years they could do no wrong, mobbed by crowds, selling millions of records, with "T Rexstasy" the name given to all the screaming girls at their concerts. They even cracked the U.S. once, with the single Get It On. Bolan had achieved his lifelong dream of fame - but in an even bigger way than he could have imagined, as many other bands followed his lead into glam. For a while, it seemed as if T Rex would remain a major act. But cracks began to appear. Bolan became more autocratic, using a lot of drink and drugs and becoming more paranoid. He split up with his wife, then band members began to desert, with Finn hanging on longest, only leaving in 1975. Bolan's star began to fade, but slowly. He was still having hits, even if they weren't the huge chart smashes of previous years. He came back in 1977 with an album called Dandy in the Underworld that brought excellent reviews and he seemed set to have his career back on track as he landed a TV series, Marc, which introduced several of the emerging punk bands. Whether Bolan could have made a successful comeback or not will always be a moot point. Whilst being driven home by his girlfriend on September 16, 1977, the car hit a tree and Bolan was killed instantly. Because of that, Bolan's legacy remains strong and he's remembered for the singles - and many of them, although basic, were good. "Shady politician in my bed Tying bolts of lightning to his head...." Who else but Marc could pull this style off! Marc and T-Rex's pinnacle album was, of course, "The Slider." It's been over four decades since its release and yet the music and the vocals always sounds fresh and inspired; I never tire of listening to it. Looked at song by song, there really isn't a lame track on the entire album and collectively, they make for the best fascinating, dreamy, 53 minute excursion into anywhere you want to let yourself be carried away to.